INCREDIBLE VALUE - LIMITED QTY - DON'T WAIT ON THIS ONE!!! 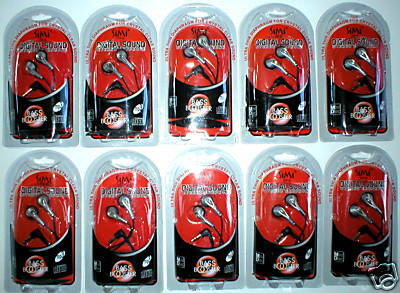 THIS IS A BRAND NEW WHOLESALE LOT OF 10 STEREO DIGITAL SOUND EARPHONES, EARBUDS FOR MP3, IPODS ECT. ALL ARE BRAND NEW AND COME IN DISPLAY PACKAGES (Please note: Packaging updates from time to time - you may rcv updated packaging). SHIPS IMMED - GREAT RESELL OPPTY!!! PLEASE TAKE A MOMENT TO READ OUR EXCELLENT FEEDBACK - AND HOPE TO COUNT YOU AS ANOTHER SATISFIED CUSTOMER!!! SHIPPING IS 16.99 US PRIORITY MAIL (please note we do not combine shipping on multiple purchases - thank you for understanding) TO ANY US ADDRESS AND WE SHIP WITHIN APX 24 HRS (after revceiving payment) - MANY ITEMS SHIP SAME DAY (please read our Customer Comments re HOW FAST we ship). WE ARE GIFTSANDSALES AN Atomic Mall RELIABLE SELLER ALWAYS HIGHLY RATED BY OUR CUSTOMERS. THANKS AND GOOD LUCK WITH YOUR BID OR BUY NOW FOR GREAT SAVINGS! Be sure to add me to your favorites list!